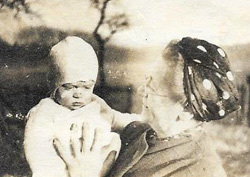 Mother’s Day this year coincides with the official end of World War II – May 8. And on May 16 of that year, eight days after the war ended, Stumbling Stone author Rudi Raab was born in Nonnewitz, Germany. In the novel Stumbling Stone, Ingrid Schmidt tells Jewish reporter Sarah Stern about fleeing Dresden when she was nine months pregnant with Karl – Sarah’s lover. Ingrid’s character in the novel is based on Rudi’s mother and this is her true story. The first part of Ingrid’s walk, from Dresden to Pirna, was for naught. By the time she arrived there, Ingrid found the Russians had preceded her. So, still lugging her two little girls, she trudged on to Nonnewitz, where her parents lived. She was nearly nine months pregnant with Karl and Karl’s two sisters were still in diapers. “One day I was walking by the side of the road. I don’t know how many days into my trek that was. I was pushing one of the girls in her baby buggy. You know, she had had polio and couldn’t walk. The other girl I carried on my arm, she had dysentery. 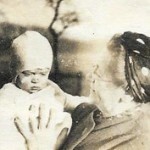 And Bueblein here, he was a few days away from being born,” Ingrid spoke softly, remembering those difficult days. “And then, Ingrid continued to talk about her flight from Dresden, describing the panic she felt, fleeing on foot, carrying her possessions on her back, dragging her children after her, artillery shells flying overhead. She talked about the terror she and the other women experienced when they considered what the Russians might do if they caught up with them. Read Stumbling Stone for free on your Kindle in honor of Mother’s Day and the end of the war – May 8-12.